Henry Knox Sherrill made his mark on The Episcopal Church, the United States of America, and the global church. Our saint grew up in a devout family and became an Episcopal priest. His parents were Henry Williams Sherrill (1853-1900) and Maria Knox Mills Sherrill (1855-1932). His brother was Franklin Goldthwaite Sherrill (1883-1933). Our saint, born in Brooklyn, New York, on November 6, 1890, graduated from Yale University with his Bachelor’s degree in 1911. At Yale his mentor had been Henry Sloane Coffin (1877-1954). Then he attended the Episcopal Theological School, Cambridge, Massachusetts, from which he graduated in 1914. The young priest opposed intolerance and favored progressive causes throughout his life. He began his ministerial career as the Assistant Rector of Trinity Church, Boston, Massachusetts (1914-1917). Next he served as a Red Cross chaplain, assigned first to a hospital in Boston (1917) then in Talence, France (1917-1919). Our saint, discharged from the U.S. Army after World War I, served as the Rector of the Church of Our Saviour, Brookline, Massachusetts (1919-1923), then as the Rector of Trinity Church, Boston (1923-1930). During his time in Boston in the 1920s Sherrill also taught pastoral care and homiletics at the Episcopal Theological School, Cambridge, and pastoral care at the Boston University School of University. Sherrill became a bishop in 1930. He, the Ninth Bishop of Massachusetts from October 14, 1930, to June 1, 1947, served as the chairman of The Episcopal Church’s Army/Navy Commission and the General Commission of Army/Navy Chaplains. In the latter capacity our saint traveled widely in combat zones. For this work he received the Medal of Merit, the U.S.A.’s highest award for a civilian. Sherrill, Presiding Bishop from January 1, 1947, resigned as Bishop of Massachusetts on June 1, 1947, in accordance with national church canons. As the Presiding Bishop our saint oversaw the organization of the Episcopal Church Foundation, the creation of the Seabury Press, and the progress of civil rights in the denomination. Integration in the whole church is inevitable; it is fundamental to the heart of the Gospel. Sherrill was also an ecumenical leader. He served as the first President of the National Council of Churches from 1950 to 1952 then as the President of the World Council of Churches from 1954 to 1961. Our saint, who resigned as the Presiding Bishop on November 14, 1958, for health-related reasons, received 21 honorary degrees from universities such as Columbia, Yale, Harvard, and Princeton. He retired to the Boston area, where he died on May 11, 1980, aged 89 years. Arthur Carl Lichtenberger (in office 1958-1964) succeeded him. Sherrill’s legacy has continued not only via institutions, but also via his family. He married Barbara Harris. The couple had four children, who had their own families and other direct and indirect influences. Edmund K. Sherrill became a priest. He was the Bishop of Central Brazil in 1975 and the Bishop of Northern Brazil five years later. Barbara Prue Sherrill married Mason Wilson, Jr.
Henry Williams Sherrill (1922-2001) became an Episcopal priest. Franklin Goldthwaite Sherrill II, or F. Goldthwaite Sherrill, served as the Rector of Grace Episcopal Church, Brooklyn, New York, New York, from 1967 until his retirement in 1993. He died, aged 87 years, in late July 2017. Tagged with Arthur Carl Lichtenberger, Barbara Harris Sherrill, Barbara Prue Sherrill Wilson, David E. Summer, Edmund K. Sherrill, F. Goldthwaite Sherrill, Franklin Goldthwaite Sherrill, Franklin Goldthwaite Sherrill II, Harry S Truman, Henry Knox Sherrill, Henry Sloane Coffin, Henry Williams Sherrill, Maria Knox Mills Sherrill, Mason Wilson Jr.
You have to think like a hero merely to behave like a decent human being. as (is) this (very) day. loving the sojourner, by giving him food and clothing. by his name you are to swear! It is very dangerous to be right in matters on which the established authorities are wrong. Robert Ellsberg, in All Saints: Daily Reflections on Saints, Prophets, and Witnesses for Our Time (1997), lists April 7 as the feast of André Trocmé. One could, I suppose, also choose April 6, April 28, June 5, October 10, or November 2, if one were restricting oneself to birth and death dates. However, on this, my Ecumenical Calendar of Saints’ Days and Holy Days, April 12 works fine. Being a merely decent human being can be difficult and mortally perilous. Those who behave as decent people during such circumstances are moral giants. André Trocmé, born in Saint-Quentin-en-Tourment, France, on April 7, 1901, identified with the downtrodden and understood the Biblical mandate to care for them. He, of Huguenot (properly pronounced U-guh-NO; the “t” and “s” are silent) stock, knew the history of the persecution of French Calvinists. André had also been a poor refugee during World War I. He studied theology at Union Theological Seminary, New York, New York, where Henry Sloane Coffin taught and, in 1926, became the president of the institution. In New York City André met and fell in love with Magda Grilli, Italian-born yet of Russian ancestry. Members of her family had resisted authority in both Italy and Russia. The couple married in 1925. In 1934 André became the pastor in the Huguenot village of Le Chambon-sur-Vignon, or Le Chambon, for short. He, Magda, and their children settled in the town, whose population went on in just a few years to commit great and unfortunately rare acts of morality and heroism. For Pastor Trocmé the essence of the gospel of Jesus Christ was to live according to the ethical standards of the Sermon on the Mount–to love God and one’s neighbors. He also emphasized the portion of Deuteronomy I have quoted at the beginning of this post. He was also a pacifist. Pacifism, of course, does not necessarily mean surrender to injustice. No, it means resisting injustice by nonviolent means. This is a fact that some of the college students to whom I teach U.S. history fail to grasp. I recall, for example, one pupil who, even after I corrected him in writing, insisted on describing Quakers as “passive-aggressive,” not pacifistic. The location of Le Chambon-sur-Vignon is slightly to the southeast of Yssingeau, in Haute-Loire. The inhabitants of Le Chambon were neither passive nor aggressive. No, they were Christian and merely decent. In 1940, after the Third Reich took over France, the German government established a puppet state (the French State, in English), commonly called Vichy France. The rest of France fell under direct German rule. Le Chambon fell within the borders of Vichy France. The Trocmés resisted the ultranationalism of the French State. Resisting authority came naturally to them, especially Magda. So did sheltering refugees. As I have written, André had been one. Also, Magda had worked in a camp for refugees from Francisco Franco’s Spanish Christian Fascists (Falangists, technically), officially neutral during World War II yet sympathetic to the Nazis. Starting in 1940, with the help of the American Friends Service Committee, the Trocmés led the village in resisting the laws of the Third Reich and of Vichy France while obeying the laws of God. Le Chambon and the neighboring farms became centers for sheltering Jews, many of them illegal aliens. In 1942 the order to deport French Jews took effect. The body count of that order exceeded 83,000. In Paris alone, in the summer of 1942, the number of deported Jews was about 28,000. Over years, however, the villagers of Le Chambon, led by the Trocmés, sheltered and saved no fewer than 2,500 Jews–perhaps as many as 5,000. Vichy and Nazi authorities noticed yet never could capture any Jews there. A doctor who forged documents died in a concentration camp. Starting in early 1942 André had to go on the run, so Magda, who had helped him lead the village’s efforts, performed more duties. There were, after all, documents to forge and deliveries of food and clothing to make. The villagers of Le Chambon did not consider their actions in sheltering Jews remarkable. This was an expression of their faith, after all. Those actions were, however, relatively rare in France during World War II. They also met with the disapproval of the leader of André’s denomination. Daniel Trocmé, born on April 28, 1912, was André’s nephew. Daniel, a science teacher and a compassionate man, had fragile health, including a heart condition. He taught at Masion Les Roches, a Huguenot boarding school, in Verneuil. In 1941 he accepted his uncle’s invitation to become the principal of Les Grillons, the boarding school for Jewish children at Le Chambon founded by the American Friends Service Committee. Daniel was a kind and conscientious educator. Eventually he left to assume the leadership of Maison Les Roches. There Daniel sheltered Jewish youth. Agents of the Gestaop raided the school on June 29, 1943. Our saint did not flee the authorities, who detained him, along with 18 pupils. He did not deny sheltering Jews. No, Daniel told the agents that sheltering Jews was the morally correct action. He spent the rest of his brief life as a prisoner, dying, aged 31 years, at Maidanek Concentration Camp, Lublin, Poland, on April 6, 1944. André continued to live out his faith after the liberation of France. He served as the European secretary of the International Fellowship of Reconciliation. And, during the Algerian War, our saint cooperated with Mennonites to help French conscientious objectors. He died, aged 70 years, at Geneva, Switzerland, on June 5, 1971. Magda died, aged 91 years, in Paris on October 10, 1996. She lived long enough to witness the villagers, her husband, Daniel, and herself recognized formally as Righteous Gentiles. Some of the passages of scripture that trouble me the most are those that counsel submission to authority–especially, in historical context, that of the Roman Empire. Although freedom cannot exist amid anarchy, there are times when defying “legitimate” political authority is the only morally correct course of action. This is a nuance I do not detect in the germane New Testament passages. The Trocmés understood that nuance well, however. If there is one characteristic more than others that contemporary public worship needs to recapture, it is the awe before the surpassing great and gracious God. God is to me that creative force, behind and in the universal, who manifests Himself as energy, as life, as order, as beauty, as thought, as conscience, as love. There are three kinds of patriots, two bad, one good. The bad ones are the uncritical lovers and the loveless critics. Good patriots carry on a lover’s quarrel with their country, a reflection of God’s lover’s quarrel with all the world. It is one thing to say with the prophet Amos, “Let justice roll down like mighty waters,” and quite another to work out the irrigation system. With this post I replace two former posts with which I had become dissatisfied. By telling the stories of Henry Sloane Coffin and William Sloane Coffin, Jr., together I also emphasize connections and relationships, one of my purposes in renovating my Ecumenical Calendar of Saints’ Days and Holy Days. The Coffins, uncle and nephew, were prophetic figures who incurred much condemnation by fundamentalist Christians during their lifetimes. Both Coffins continue to incur much condemnation by fundamentalist Christians, as a simple Internet search reveals. Henry Sloane Coffin, born in New York City on January 5, 1877, came from a prominent family. The family firm, W. & J. Sloane, sold upscale furniture and rugs. It also became involved in real estate development and in low-income housing. Attorney Edmund Coffin, Jr., and Euphemia Coffin had two especially noteworthy sons–Henry Sloane Coffin and William Sloane Coffin, Sr. The latter of these men worked in the family firm, joined the Board of Trustees of the Museum of Modern Art in 1924, and became the board’s president seven years later. Henry grew up in New York City, in the lap of privilege and a corresponding sense of social responsibility. He studied at Yale, became a Bonesman, and graduated in 1897. Next our saint studied theology at New College, Edinburgh, Scotland, for two years before returning to the United States and working successfully on two concurrent degree programs–Bachelor of Divinity (Union Theological Seminary, 1900) and Master of Arts (Yale, 1900). Henry was a Presbyterian minister. He, ordained in the Presbyterian Church in the U.S.A. in 1900, served as pastor of Bedford Park Presbyterian Church, the Bronx, until 1905, when he transferred to Madison Avenue Presbyterian Church, New York City. Our saint, a conscientious pastor and visitor in parishioners’ homes, built up Madison Avenue Church from a struggling congregation to one of the largest in the city during his tenure, which ended in 1926. Starting in 1904 Henry doubled as a part-time Associate Professor of Homiletics and Practical Theology at Union Theological Seminary. Finally he accepted an offer to become the President of the seminary in 1926. “Uncle Harry,” as students called him, guided the seminary financially through the Great Depression and hired Reinhold Niebuhr and Paul Tillich. Among Henry’s greatest accomplishments was helping to avoid a schism (related to the fundamentalist-modernist controversy) in his denomination in the middle 1920s. A minor schism, creating what became the Orthodox Presbyterian Church, occurred in 1936, but no major split occurred in the 1920s. William Sloane Coffin, Jr., born in New York City on June 1, 1924, was a son of William Sloane Coffin, Sr., and Catherine Butterfield Coffin. Our saint, known informally as Bill, lost his father in 1933. The family fortune had declined, and William Sr. had refused to evict low-income tenants who could not afford rent. Catherine took her family into exile in Carmel, California, where they moved into a bungalow and the children attended public schools. In 1937 Uncle Harry began to finance the educations of Bill and his younger sister. Bill began to study at Deerfield Academy in Massachusetts and Catherine left California. The following year Catherine took Bill to Europe, where he studied classical piano–first in Paris, with Nadia Boulanger, then in Geneva–until June 1940, when World War II forced their return to the United States. Henry, who received many honorary degrees, was prominent on the Christian and world stage. His image graced the cover of the November 15, 1926, issue of Time magazine. Our saint was also active in ecumenism, working successfully for the creation of the World Council of Churches (1948) and unsuccessfully in the 1940s for the merger of the Presbyterian Church in the U.S.A. and The Episcopal Church, then officially the Protestant Episcopal Church in the U.S.A. Uncle Harry also worked with former U.S. President Herbert Hoover to send provisions to the United Kingdom prior to December 8, 1941, and supported U.S. involvement in World War II. Bill Coffin went to war. He graduated from Phillips Academy, Andover, Massachusetts, in 1942, began studies at Yale Music School, then received his military draft notice in 1943. For fur years he served in the U.S. Army, ending up in military intelligence. Next our saint returned to Yale, joined the Skull and Bones Society (of which friend and classmate George Herbert Walker Bush was also a member), and graduated in 1949. The Central Intelligence Agency (C.I.A.) recruited Coffin at Yale, but he initially chose theology instead. In 1949 he matriculated at Union Theological Seminary yet left for the C.I.A. the following year, shortly after the beginning of the Korean War. At the C.I.A. Coffin taught Soviet émigrés the arts of spycraft. Our saint left the agency over Eisenhower-era C.I.A. coups against democratically elected governments, however. He graduated from Yale Divinity School, became a Presbyterian minister, and married actress Eva Rubenstein in 1956. Uncle Harry retired from Union Theological Seminary in 1945 then toured the Orient and studied missionary work there. He died, aged 77 years, on November 25, 1954, at Salisbury, Connecticut. His wife, Dorothy Prentice Eells (married in 1906; died in 1983) and two children (Ruth and David) survived him. Light mine eyes to see my duty. Let thy light shine through me. A Half-Century of Union Theological Seminary, 1896-1945 (1954). William Sloane Coffin, Jr., became a social activist. Unfortunately, stresses associated with his quest for social justice ended his first two marriages (in 1968 and 1975). In 1956-1957 our saint filled the one-year appointment as chaplain at Phillips Academy. In 1957 he became the chaplain at Williams College. There our saint’s support for civil rights (especially in relation to the events in Little Rock, Arkansas) and criticism of fraternities created controversy. One fraternity brother went so far as to shoot out Coffin’s living room window in anger. From 1958 to 1975 our saint served as the chaplain at Yale University. At Yale Coffin became involved in the Freedom Rides in the South, opposed the Vietnam War, and supported young men who refused to cooperate with the military draft. For his nonviolent anti-draft activities Coffin faced federal charges, went on trial, and became a convict. Later an appeals court overturned the conviction and the government dropped the charges. To oppose government-sponsored violence nonviolently can place one is legal jeopardy, unfortunately. Coffin served as the senior pastor of The Riverside Church, New York City, from 1977 to 1987. He opposed Apartheid, lobbied for nuclear disarmament, and spoke out in favor of gay rights–when the latter was a marginal position, even on the Left. He resigned in 1987 to work on the nuclear disarmament issue full-time. Our saint was quite active during much of this retirement. From 1989 to 1992 he led SANE/FREEZE, dedicated to disarmament and a freeze on atomic weapons. Then he and third wife Virginia Randolph Wilson (married in 1984) moved to Vermont. Coffin continued to travel and speak on a variety of topics, including his opposition to the Iraq War. At the end of his life our saint suffered a series of strokes. He died, surrounded by family, on April 12, 2006. He was 81 years old. Henry Sloane Coffin and William Sloane Coffin faced different challenges. Both of them responded to those issues in front of them in accordance with the Gospel of Jesus Christ and the prophets’ call to social justice, as they understood those high standards. They were controversial in their times. They were probably correct more often than not. Louis FitzGerald Benson was the son of a Philadelphia, Pennsylvania, businessman and elder at the Tenth Presbyterian Church. Our saint earned his Juris Doctor degree from the University of Pennsylvania then practiced law. After a few years, however, he perceived and followed a different vocation. So he enrolled at Princeton Theological Seminary. Benson, ordained the Presbyterian Church in the U.S.A. (1869-1958) in 1888, pastored one congregation, the Church of the Redeemer, Germantown, Pennsylvania, for six years. Then he embarked upon his true calling. The Hymns of John Bunyan (1930). Our saint, a scholar of hymnody, had a 9,000-volume library. Our saint shared the first draft of the following hymn, written on November 21, 1924, with his good friend, Henry Sloane Coffin. Coffin provided praise and constructive criticism, which influenced the final draft. Now we give Thee thanks, O Lord. Let Thy Kingdom come, O Lord. …the foremost hymnodist that America has produced. I detect irony, for Benson was to the left of that congregation’s current theological position. He associated with the likes of Henry Sloane Coffin and Henry Van Dyke, liberals in their denomination. 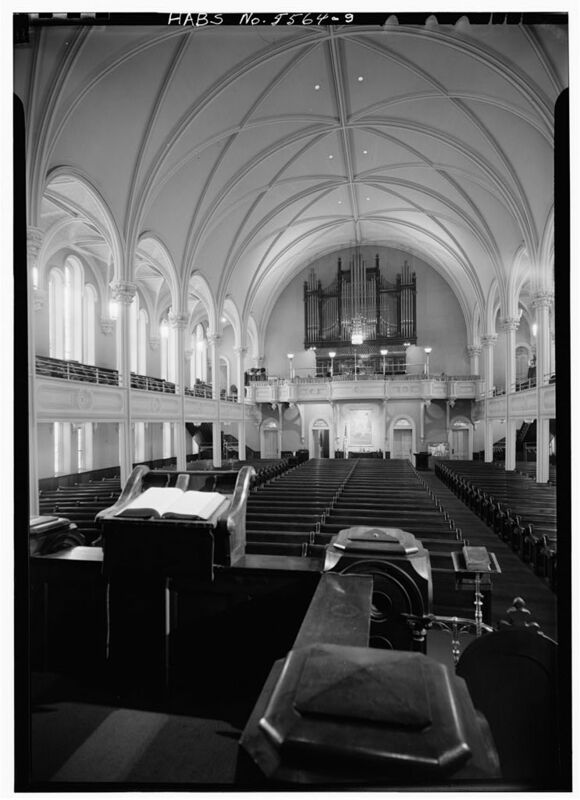 In 1981 Tenth Presbyterian Church affiliated with the Presbyterian Church in America (1973-), which is far to the right of Coffin, Van Dyke, and Benson. When singing in all our churches has these marks, the joy of worship will revive and the churches will fill up. Indeed, beauty and reverence in hymnody, combined with great substance thereof, is proper. who have nurtured and encouraged the reverent worship of you. May their work inspire us to worship you in knowledge, truth, and beauty.